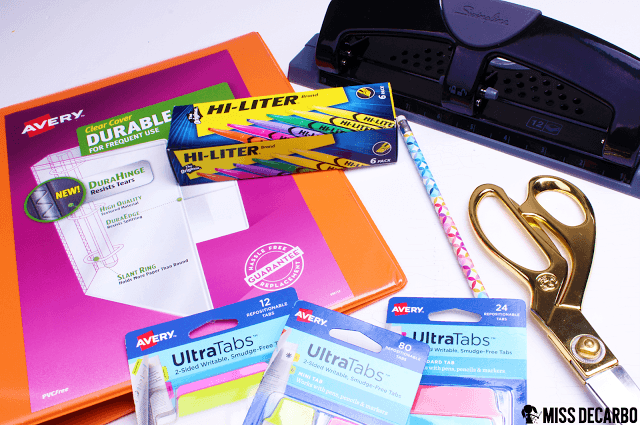 Recently, when one of my favorite school supply companies, Avery, asked if they could send me some school supplies so that I could create something special with them for my followers. YES, PLEASE! When I opened the box of goodies, I was so excited because I knew exactly what I wanted to share with you! 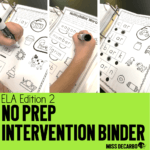 Today, I’m going to share how, why, when, and what I use to implement poetry binders into my classroom. I have been using poetry binders since my very first year of teaching, and they are most definitely a core staple of our weekly routine. 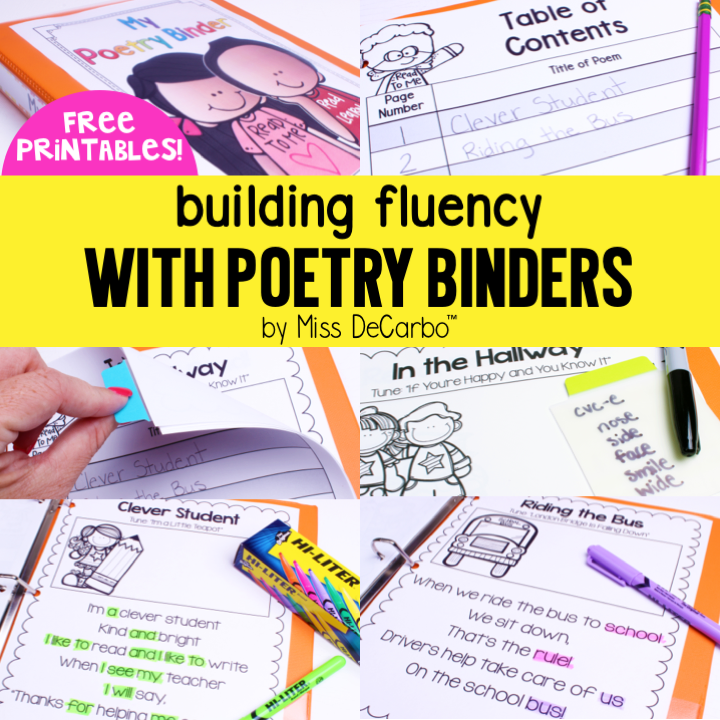 I’m also going to share some really fun FREEBIES with you that will help you create, set up, and implement poetry binders in your own classroom. Research tells us that repeated reading is critical to fluency progress for our learners. We also know that repeated reading that results in some type of “performance” is even more powerful. Now, do not let the word “performance” scare you. In my classroom, our “performance” is simply reading and singing the poem with a partner, a small group, or even as a whole class to just ME! We are not talking about a studio set up with a red carpet, Oscar-worthy performance. 😉 Poetry is also powerful for learning how to read with emotion and intonation. It helps students understand how to connect to the text. Perhaps one of the most important reasons I use poetry in the classroom is that it’s FUN! I love when we can set our poetry to music, and integrate repeated reading and singing into our poetry binders time. As we continue to add more poems to our binders, my students become very, very familiar with the text on each page. This helps to build their confidence and create eager, happy readers and singers in my room! Taking 10 minutes a day to read familiar text has truly made a powerful impact in the fluency of my students. I have used poetry binders in first and second grade, and I can confidently say I would even use them with fifth graders and tenth graders! It’s THAT powerful – and it doesn’t take a lot of time. We practice and add poems to our binder 10 minutes before lunch. It’s quick, effective, and it also leads to authentic “word hunts.” These “word hunts” are targeted phonics skills that we review by using our poem. 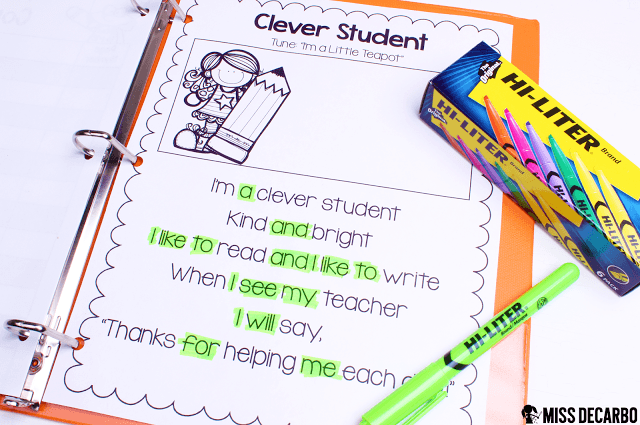 For instance, we may take our highlighters and find all of the short vowel words in our poem for the week. Or, we may highlight all of the r-controlled vowel words we can find. 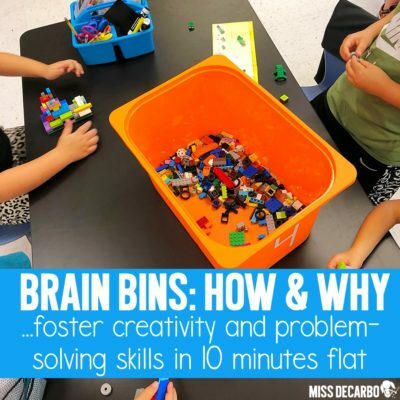 There are so many possibilities, and it helps integrate necessary skills so that we can “fit it all in” throughout the day. 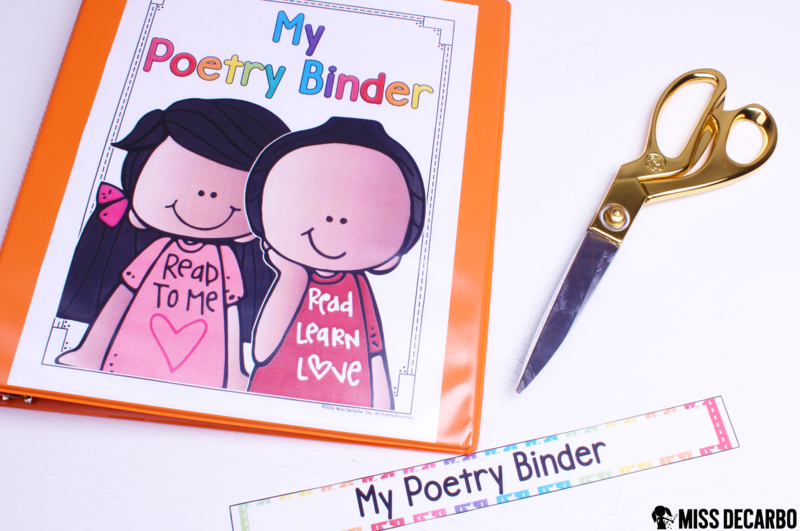 Poetry binders also make wonderful little “fast finisher” activities. 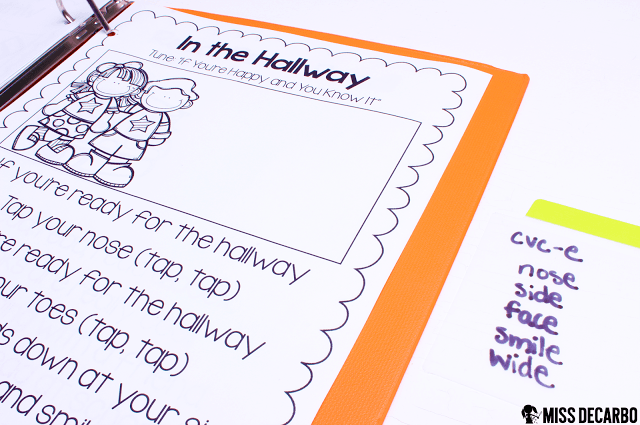 My students are trained to know that if they finish a task early in the classroom, they can whip out their poetry binders and practice reading their familiar songs and poems. Poetry binder time has always, and I believe it will always, be a valued and very special moment in our day together. Monday: Add a new poem to our binders. We follow an “I read, we read, you read” sequence. 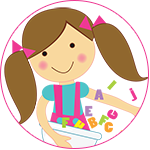 Tuesday: Review yesterday’s poem and go on a “word hunt” for a specific phonics skill. Wednesday: Re-visit yesterday’s poem and practice a few older poems from our binder. 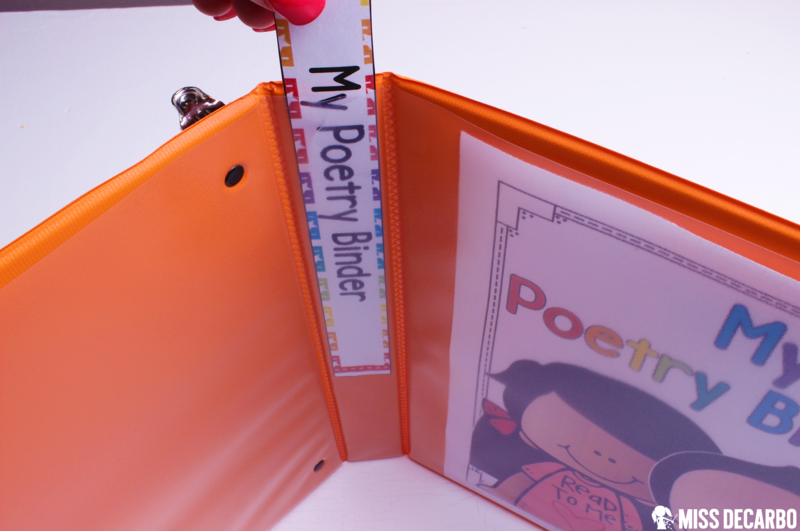 Now that we’ve discussed the why and when for poetry binder time, let’s move on to MAKING our poetry binders! 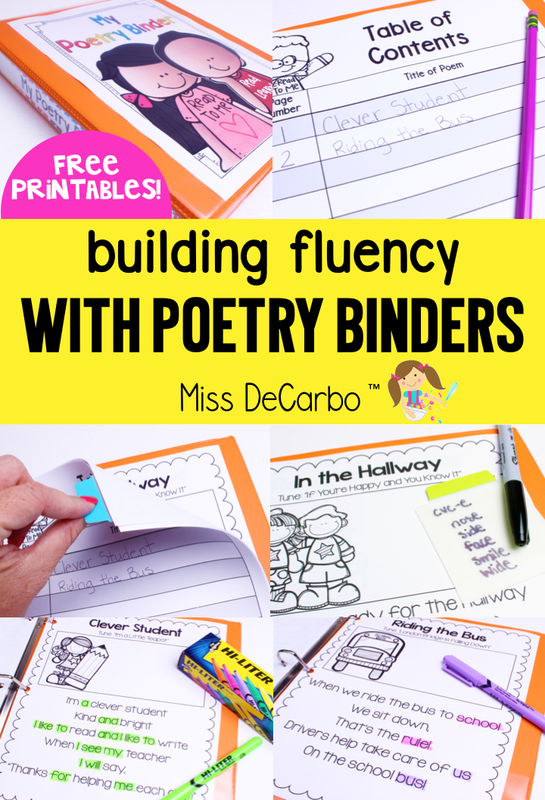 Throughout these easy to follow steps, I’ll also share activities, tips, and tricks for instruction during your poetry binder time. Here we go! 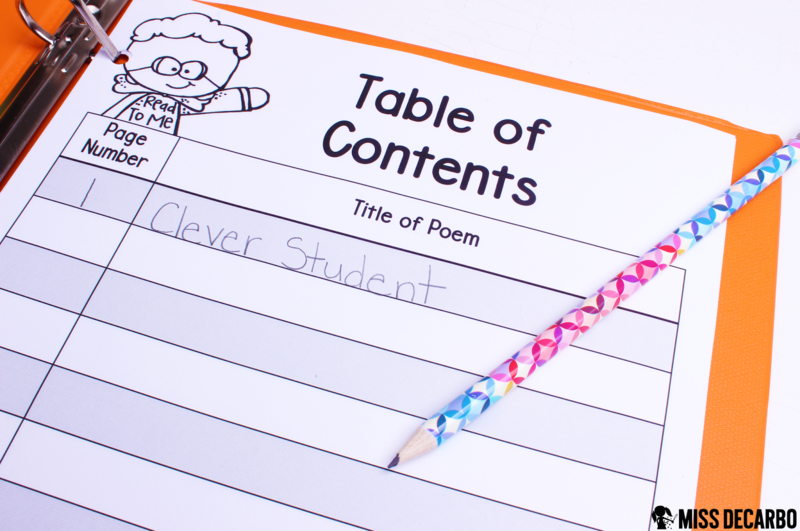 The first thing you will want to do is use the link at the bottom of this post to print your poetry binder freebie binder cover and spine label. I have included both color and black and white versions, in case you would like to print your printables on colored paper to save ink. 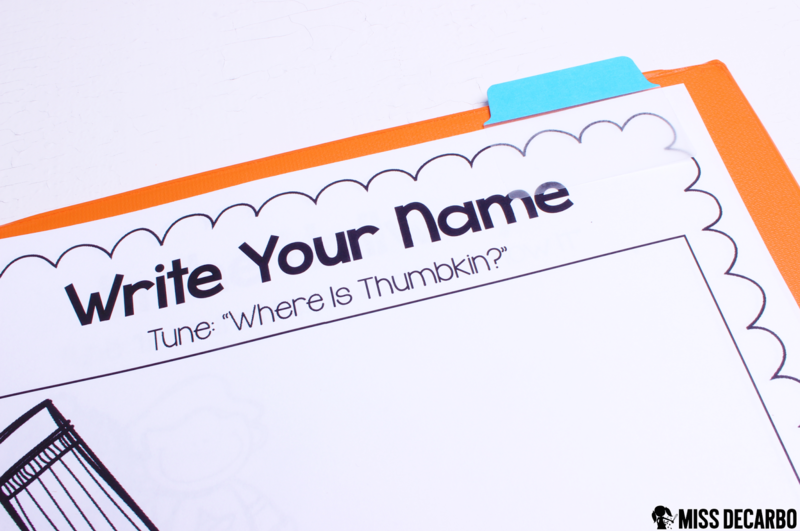 I also have a version that includes a space for your students to add their name. Slide the binder cover into the Avery Binder Front Clear Pocket. Cut out the corresponding sized spine label and insert it into the binder. 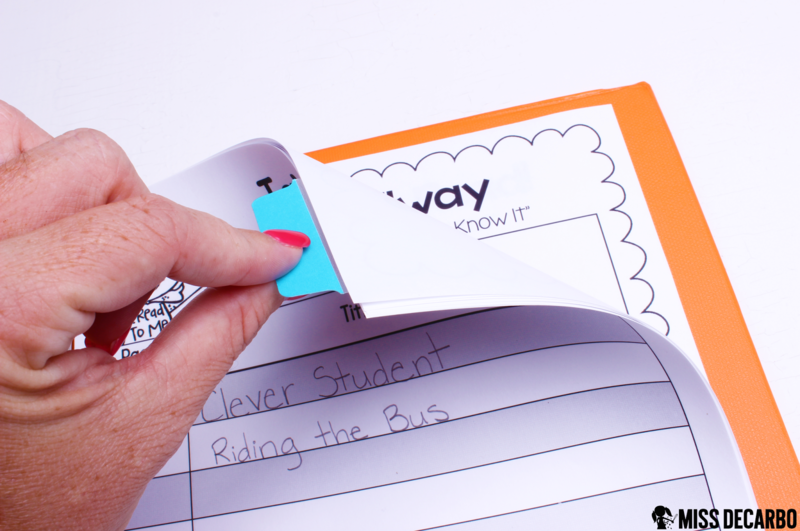 Do you need a trick for getting those tricky spine labels into your binder? Bend the binder backward and then insert the spine label into the pocket. It creates more room and makes this task much easier! Beautiful, right?! Now, we’re ready to set up the rest of the poetry binders! My students fully assemble their own binders at the beginning of the year. In the rest of the post, I will show you how they do this. The only thing I do for them beforehand is the cover and the spine label, because that can be pretty tricky for little hands! Step Three: Adding the Table of Contents and Poems! Within the freebie printable pack is a Table of Contents page. You’ll want to start your students off with either one sheet, or a few sheets at a time for the front of their binder. In my classroom, I start every student off with three pages of the Table of Contents. There are enough spaces to write in 12 poems on each page. 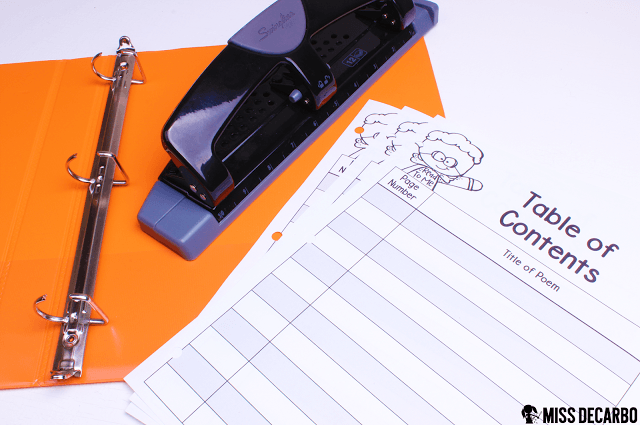 Use your 3 hole punch to punch the pages. Then, you (or your students) can place the pages in the front of the binder. 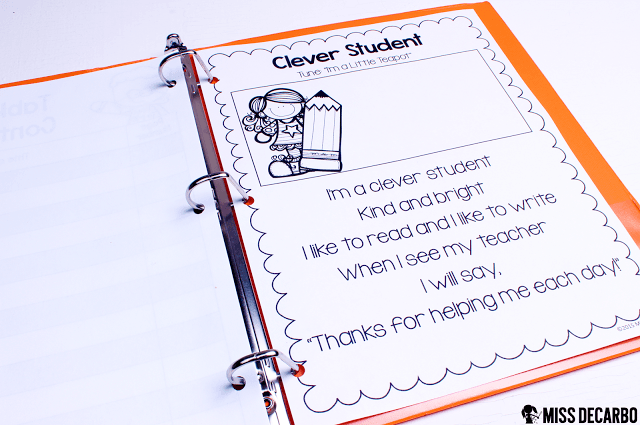 Now, you are ready for your students to insert their first poem into their poetry binder! 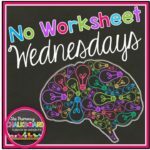 This is cause for LOTS of celebration and excitement in your classroom! 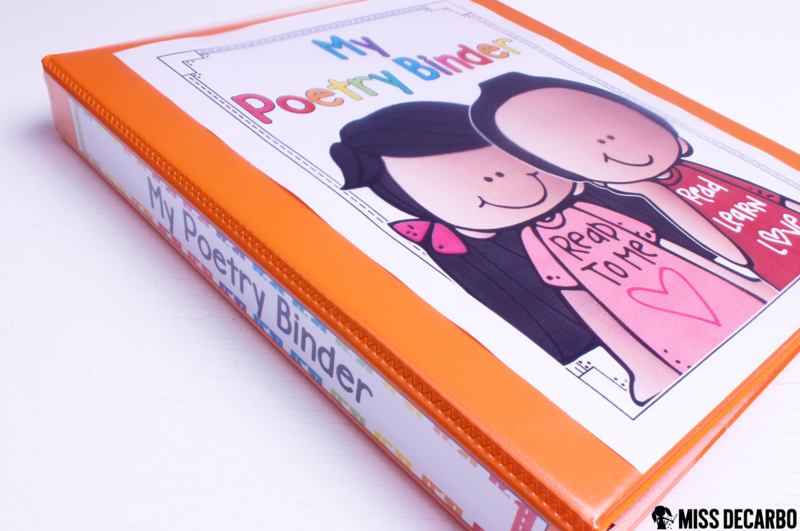 I like to REALLY play up the poetry binders because I want my kids to fall head over heels in LOVE with them! (And trust me, they really do!) It becomes one of my students’ favorite items in their desks. I’ve included a FREE poem/song for you to add to your students’ binders. 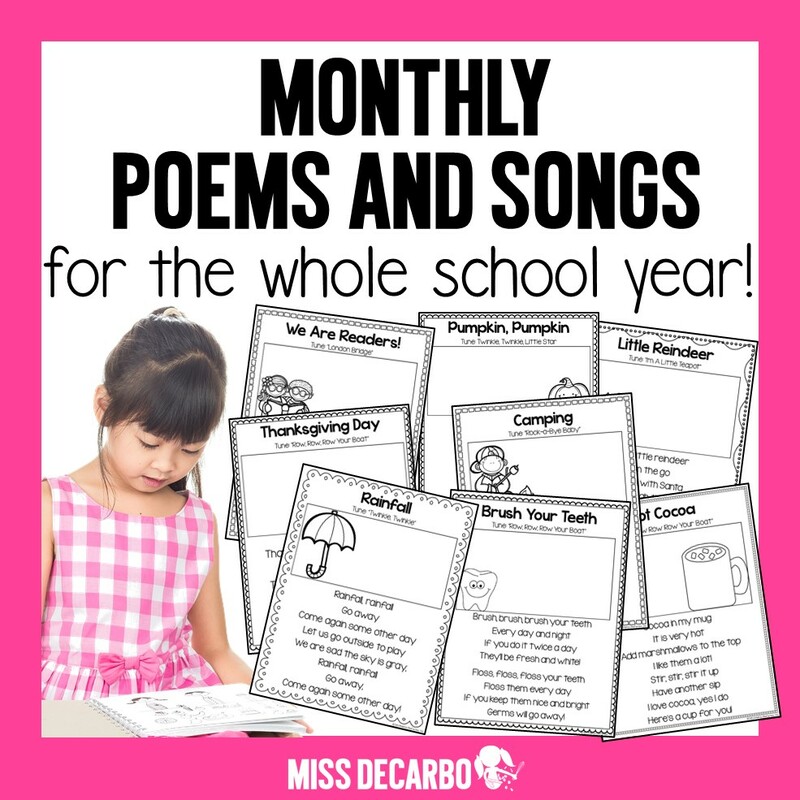 All of our poems come from my Monthly Poems for the Whole Year resource in my TpT Store. After a year of hard work, I wrote 45 poems that are set to a familiar tune! 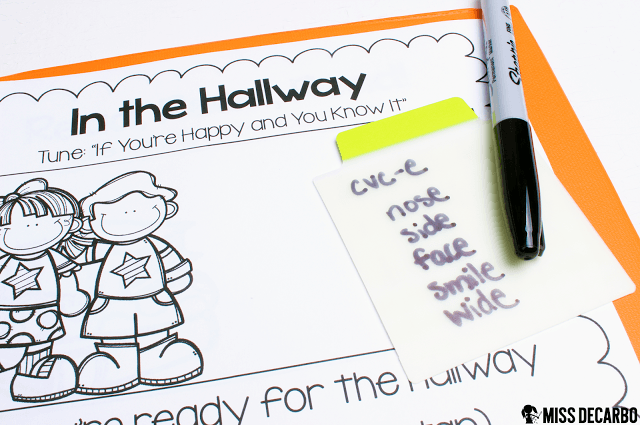 Your students can read or sing their hearts out while they practice their poems. It is SO.MUCH.FUN! The FREE printable pack in this blog post contains the poem: Clever Student. 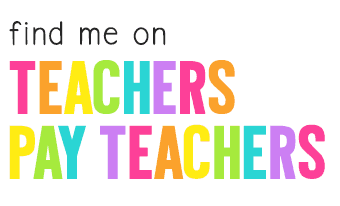 It is set to the tune of “I’m a Little Teapot.” I hope you and your students love it! Step Four: It’s Poetry Time!!! 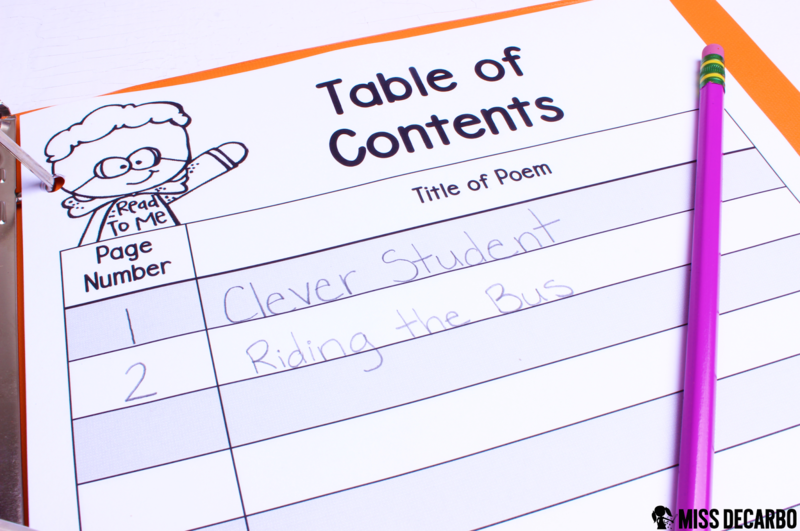 Every time you add a poem to your students’ poetry binders, they write the title of the poem and the page number onto their Table of Contents page. 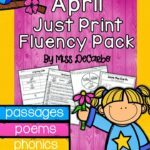 This helps them organize their poems, find poems quickly, and learn exactly how a Table of Contents works because they are creating one every single week. Adding, learning, reading, and singing our new poem or poems of the week is SO fun for my class! They are reading and building fluency without even knowing it. But reading and singing are not the only things we do with our poems. We also integrate phonics and sight word practice and review into our poetry binders. After all, poetry and songs are rich sources of text, so it makes sense to integrate our language instruction and fluency instruction together. We spend a lot of time at the beginning of the year looking and hunting for sight words. We highlight sight words we see and find in the poems, or sight words that we already have on our Word Wall. 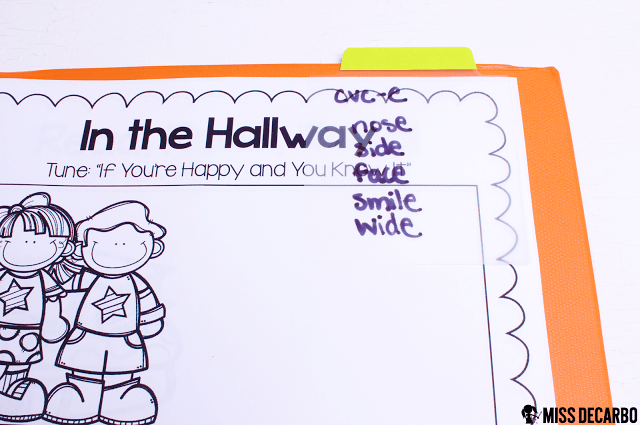 I might also introduce a new sight word and have the students highlight the word or draw a special circle around it. 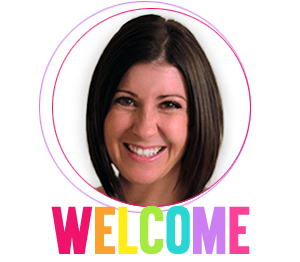 The goal is to completely engage with the text – on the fly! I know I have a few people who are reading this right now, wondering if I have a “master list” of what we hunt for in each poem. The answer is actually…no! I don’t have a list of which skill or which words we highlight for each poem. Why? Because every class is different, and I am a firm believer that educators have to do what is best for their individual group of students, not always what a scripted handout tells us to do. 😉 Because our poetry binders serve as supplemental practice and reinforcement for phonics and language skills, I have the flexibility to base what we highlight and discuss each week on what my students need in the moment. There are always language discussions you can have with your students in EVERY piece of text. 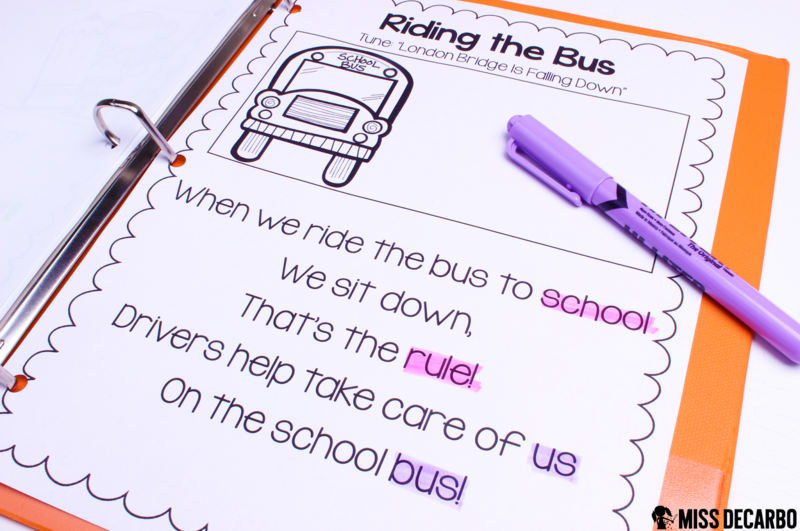 🙂 In the photograph above, we quickly highlighted the rhyming words in our Riding the Bus poem. The important thing to remember is that this is a quick, easy, and no-prep mini-lesson (really mini), review, or introduction. Poetry binder time is meant to enhance fluency and quickly zero-in on a specific target goal you may want to address that day. I think it’s important to note that I do not always do “word hunts” with my students. Sometimes, we just read, sing, and enjoy! Why do I love Avery Ultra Tabs? They are colorful and you can completely re- position them. They won’t tear the paper and they are super durable! I pass one out every now and then for my students to use as a bookmaker of where we left off in our poetry binders. The kids LOVE them! 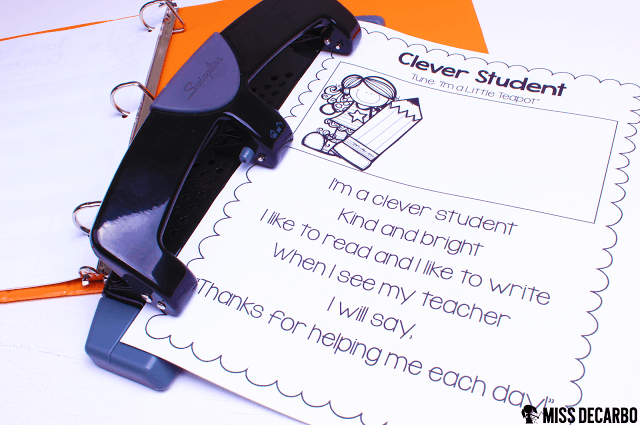 I can stick the tab with the words I want to focus on directly on the poem printable. It doesn’t ruin my teacher copy, and I can easily remember what I wanted to review! I often like for my class to go on our word hunts together, so I stick the tab beside me as I direct the students through our activity. (Especially at the beginning of the year, when are just learning how to utilize our binders.) Then, I can easily stick it back on the page as a reminder for next year. This keeps me really organized and saves paper! I hope you really enjoyed reading about how I set up, organize, and utilize poetry binders in my classroom. 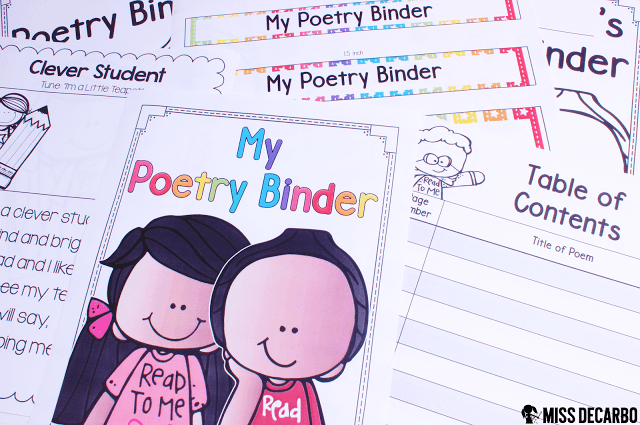 If you’d like to grab the freebie printables in order to set up your own poetry binders for your classroom, you can click on the text below. I’ve also included a graphic and a link to my Monthly Poems for the Entire Year pack if it is something you’d like to utilize and enjoy this year! At the end of the school year, my students are SO excited when I announce that they get to take their poetry binders home to keep forever! I always have a lot of parents and students who tell me that this becomes a favorite reading resource over the summer months. Poetry binders have been a wonderful way to unify my class and they have helped to form literacy memories that we share together throughout the year. Thank you so much for joining me on my blog today! Happy Reading! To Check Out ALL of My Monthly Poems, Click HERE or On The Photo Below! The Avery products mentioned in this blog post were provided to me by Avery. They were given in exchange for my own opinions and review. 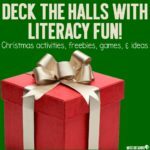 I never endorse anything for my classroom that I do not truly believe in, and I hope you will enjoy these Avery items as much as I do! « Teach, Create, and Engage with Oriental Trading!